Acute Pulmonary Embolism (PE) is a relatively common medical emergency caused by occlusion of the pulmonary arteries. 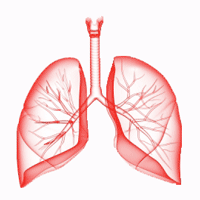 In most cases, pulmonary embolism is caused by a deep-vein thrombosis (DVT). The high effectiveness of the immediate treatment becomes vital early diagnosis, but sometimes it is difficult, because the clinical signs and symptoms are non-specific. Although the Electrocardiogram in Pulmonary Embolism is not a test with high sensitivity or specificity, we can find EKG changes to support the diagnosis of PE. The main symptoms of pulmonary embolism are dyspnea, usually begin suddenly, and pleuritic chest pain. PE can also present with pre-syncope or syncope, and in the most severe cases, with arterial hypotension and shock. We must identify the Predisposing Factors for DVT and Pulmonary Embolism to evaluate the clinical suspicion and perform secondary prevention. Previous Pulmonary Embolism or DVT. Hormone replacement therapy or oral contraceptive 1. The Electrocardiogram is not a sensitive test for the diagnosis of pulmonary embolism. In some cases appear certain changes that increase suspicion, helping in the diagnosis, but even in massive embolism, they are not always present 2. Right Bundle Branch Block, S1Q3T3 pattern. Negative T waves in leads V1–V4. Sinus Tachycardia or other types of arrhythmias such as Atrial Flutter or Atrial Fibrillation. 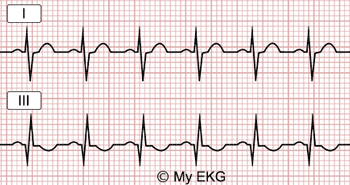 Signs of right ventricular overload: Negative T waves in leads V1-V4 and qR pattern in V1. McGinn-White Sign or S1Q3T3 pattern: S wave in lead I, Q wave and negative T wave in lead III. ST segment depression due to Subendocardial Ischemia. Incomplete or Complete Right Bundle Branch Block 2. EKG with Sinus Tachycardia (136 lpm) with S wave in lead I, Q wave and negative T wave in lead III, common finding in Pulmonary Embolism. The presence of these signs in an electrocardiogram, are suggestive but not diagnostic of Pulmonary Embolism. These EKG changes are also observed in other diseases which cause right ventricular overload such as Cor Pulmonale 2. Pulmonary Embolism should be suspected in patients with sudden dyspnea, chest pain or syncope, with predisposing factors. The Electrocardiogram has an important role ruling out other diseases with similar symptoms (Acute Myocardial Infarction). If the EKG changes previously described are present, suspicion of Pulmonary Embolism increases. In patients with suspected pulmonary embolism without shock or hypotension and low/intermediate clinical probability, plasma D-dimer measurement is the logical first step. CT angiography is indicated in patients with an elevated D-dimer level. In patients with a high clinical probability of PE, CT angiography is the first-line test 1. Suspected high-risk Pulmonary Embolism is an immediately life-threatening situation. The most useful initial test in this situation is bedside Transthoracic Echocardiography, which will yield evidence of acute pulmonary hypertension and Right Ventricular dysfunction. Evidence of RV dysfunction is sufficient to prompt immediate reperfusion without further testing. As soon as the patient can be stabilized by supportive treatment, final confirmation of the diagnosis by CT angiography should be sought 1. Pulmonary Embolism with shock or hypotension has a high early mortality risk. Respiratory and hemodynamic support should be ensured with catecholamines, oxygen or mechanical ventilation. Systemic thrombolysis is the treatment of choice for patients with high-risk PE, and parenteral anticoagulation should be initiated with Unfractionated Heparin. In patients with contraindications to thrombolysis, or in whom thrombolysis has failed, surgical or percutaneous embolectomy is recommended. Pulmonary Embolism without shock or hypotension often has better prognosis. Subcutaneous LMWH or fondaparinux is the treatment of choice. Systemic thrombolysis is not recommended in this patients. In patients with hemodynamic stability but with Right Ventricular dysfunction (intermediate-high-risk group) systemic thrombolytic therapy is indicated to prevent potentially hemodynamic decompensation or collapse, if patients have low risk of bleeding. Anticoagulation treatment with vitamin K antagonists or new oral anticoagulants is recommended for at least 3 months to prevent recurrence of venous thromboembolism. Indefinite anticoagulant treatment is recommended in patients with recurrent PE, hereditary thrombophilia or cancer 1.